We are excited to announce two new courses for supporting successful learning in schools, one for primary and one for secondary. These have been carefully curated by our Online Courses team and online social learning platform futurelearn.com,with the expert guidance of Professor Helen Bilton. 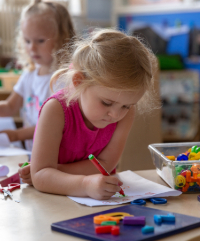 These courses draw on Professor Helen Bilton’s 35 years of experience in teacher training and education, including early years education, outdoor play and behaviour management. 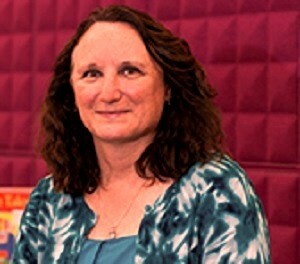 Helen Bilton’s goal in developing these free online courses is to provide accessible, interactive and educational resources for primary and secondary workers, where they can discover and discuss ideas and examples of good practice with one another. 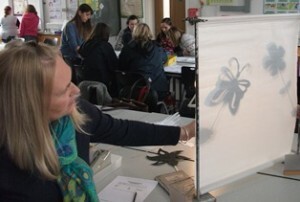 Helen has designed a range of activities so that Learners leave the course feeling more knowledgeable and ready to try what they’ve learnt within their work. Topics include how to manage a classroom and the psychology behind student behaviour. Learners will also hear first-hand from children and pupils about how they explore a learning environment. Both courses are now open for enrolment by following the link below and will begin on 22 April 2019. We are delighted to announce the launch of our new film! And no one can take it away from you. Not only as individuals but also as a society. Training you to transform lives. Become part of our global community and share our passion. At the Institution of Education we practice what we teach. This script resonates deeply with us here at the Institute of Education as we want to provide this generation and those to come with the skills to truly develop and succeed at whatever they aspire to. You may already know all about our filming this summer, with the images of school visits and film crews on our social media channels. 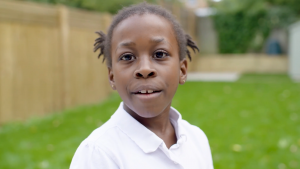 Our partners and staff went all-out to help us make this film and are due a big thank you, especially the fantastic partnership schools who helped us film: the Bulmershe School, Maiden Erlegh School and Christ the King Catholic Primary in Whitley. Thanks also to two of our talented alumni: Laura Prime, now working as a Secondary Art and Design NQT and Tayla Sutton, a Primary School Direct trainee. 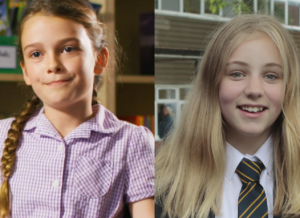 And very special thanks indeed go to the wonderful pupils who took part – we could not have made such a brilliant film without you! So check out our film here: https://bit.ly/2BpM50l and tell us what you think. To find out more about what’s happening at the Institute of Education, have a look on the website and at our Instagram , Linkedin, Facebook and Twitter accounts. 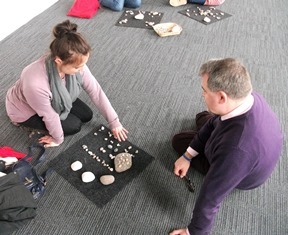 Staff at the Institute of Education are often called upon to provide expert comment. They actively campaign for change so that passionate educational practitioners have the best environment to work in and that children continue to develop successfully. Read below what was discussed in Helen’s own words. Last Thursday I was given the opportunity, alongside seven other panel members to address the next steps for early years education at the Westminster Forum. Five minutes each isn’t a long time to speak but we covered a lot of ground and interestingly though we didn’t say the same thing, we did in a way. The previous baseline assessment wasn’t workable or appropriate because it ‘didn’t tell teachers anything they didn’t know’. There are great schools out there achieving great things with children while not having to forgo their principles. Baroness Perry who chaired the forum was a force to be reckoned with, once Her Majesty’s Chief Inspector of Schools in England, she questioned how we have a system that trains teachers in one age phase to then be able to teach any age of child. We should value and keep those people who train in early years. Although the DfE spokesperson couldn’t stay for the discussions after they presented, they mentioned changes that could cut the workload. I do feel if they had stayed however, they would have seen that not one person, audience or speaker, mentioned the high workload, rather they spoke passionately, demonstrating a deep care for children, wanting to preserve a good education for all. On the other hand, the Ofsted spokesperson did mention self -regulation and that staff in settings need to articulate to inspectors their understanding of the children in their care. Going forward, I think we all need to continue to speak to anyone and everyone about education using language that talks about children in terms of growth, development and maturity. As the campaigning group declares, children are more than a score (www.morethanascore.org.uk). Moreover, we need to be discussing how we make schools ready for children and as a nation we need to consider what the priorities are for children. Finally, we need to be pushing for quality professional education so all staff are knowledgeable about child development. All in all, I came away impressed by the level of debate and the measured discussions. The early years sector has room to grow in strength. I feel emboldened to campaign for change. 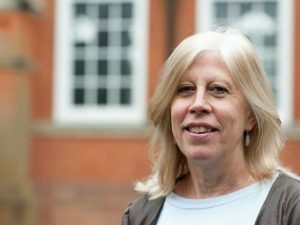 Dr Rebecca Berkley, Lecturer in Music Education at the University of Reading started the Universal Voices children’s choir in March 2017. 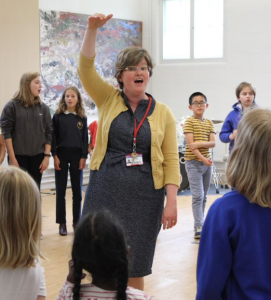 Rebecca has run children’s and adults choirs for Berkshire Maestros, the Berkshire Young Musicians’ Trust; for Sing Up, Kennet Opera, and Sing for Pleasure, the National Singing Charity. She started Universal Voices so that students training as primary music teachers on the BA in Primary Education (QTS) programme could learn how to run a choir, develop their conducting skills and learn to teach musicianship. The choir was launched at the Institute of Education Partnership Concert: Songs and Stories in March 2017. 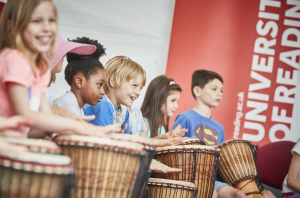 With the support of Music at Reading and the Campaign and Engagement Supporters’ Office, this concert brought together 270 children from the Reading area, who sang alongside music education students who also managed the concert. Universal Voices began rehearsals in April 2017 with around 30 children, and membership has risen to 40 as more children joined. The choir has performed regularly at University events like the University Advent Concert, the Big Band Big Lunch, and Alumni Family Funday. In 2018-19 they will present a join concert with Christ Church Choir, and also complete in the Woodley Festival for the first time. The second Partnership concert in March 2018 was a performance of Britten’s Noye’s Fludde, with Universal Voices taking the roles of Noye’s children, a chorus of 250 children from partnership schools and BA Ed and PGCE students from the Institute of Education taking solo singing roles and playing in the orchestra. The whole event was project managed by second year students who got to work with Music at Reading to manage the concert and led rehearsals with our partnership schools. This performance was nominated for a Reading Cultural award as best Community Project of 2018, and won an Institute of Education teaching and Learning award. March 2019 will see the next round of second year students lead a concert called Animal Crackers. The University Big Band will lead an animal themed concert featuring creative composing and performing projects from children from local primary schools, and songs from the Jungle Book. 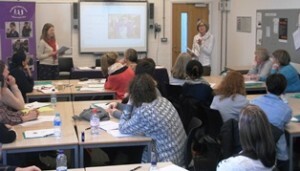 The University of Reading’s Institute of Education (IoE) has introduced an innovative mentoring scheme which bodes well for trainee teacher development. Students praise the extra insight, knowledge and tips they receive through the scheme, alongside all the on-going support. The new scheme aims to nurture mentoring skills whilst boosting teachers’ and trainees’ Continuous Professional Development (CPD) – absolutely vital in the rapidly evolving world of education. Trainee teachers from the IoE experience immense benefits in their training schools from the support they receive from mentors. It is a responsibility the mentors take very seriously, ensuring that by giving their mentees the kind of experience that smooths the transition to teach, these students will have a strong base from which to launch their careers and be the best teachers they can be. Whilst being mentored, students are able to explore teaching life and career goals based on the experience and perspective of a mentor who is already ‘out there’. Yet it is not just the student who gains from such a partnership. For the mentor, the benefit is not confined to seeing changes in their mentee student arising from their encouragement and support – though this is hugely rewarding of course. But, say mentors, spending time mentoring current students with their fresh ideas and creative approach has also been perspective-shifting and energising for them. Mentoring, they enthuse, is a two-way benefit. This is the backdrop to the IoE’s introduction of the new Mentor Certification Programme which nurtures teachers and practitioners in developing and reflecting on their skills for effective mentoring – ensuring an already robust and successful mentor programme continues to grow alongside the ever-developing world of teaching. 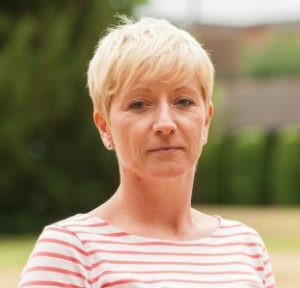 The new programme has been made specifically flexible to support busy professionals, with a further benefit arising from the support it provides for teachers’ and education practitioners’ career development: the strong element of Continuous Professional Development (CPD) is a key component of the new scheme. Schools and settings have been enthusiastic about these skills-enhancement activities but have also experienced a different kind of positive from the scheme: research has shown a strong link between effective mentoring and recruitment and retention of teachers. Reading Partnership Teachers (RPTs) are regularly offered roles in their placement schools, so active engagement with the Partnership in training new teachers proves an excellent way for schools to recruit Newly Qualified Teachers (NQTs). The Certification scheme has already drawn strong interest from colleagues in schools and settings wishing to cultivate their mentoring expertise. Those already mentoring in Partnership settings are being invited to join the new Certification programme at the level that suits their experience. The IoE is ranked 3rd in the UK for Education (The Guardian University League Table 2018), with internationally renowned and award-winning academics. The Institute’s strong links with local – and not so local – schools enables an outstanding Partnership that can create the next generation of exceptional teachers. The IoE’s high levels of pastoral care and the exemplary experience that students enjoy are regularly reflected in the annual National Student Survey (NSS), with 2017’s ranking the IoE a high 90% for satisfaction. Indeed, one of the Institute’s key strengths, as recognised by Ofsted, is the high quality of support it provides to schools, mentors and Reading Partnership Teachers (RPTs) on placement. Click here to discover more about mentoring and Mentor Certification from some of our Reading Partnership Mentors. The Institute is keen to welcome experienced teachers and practitioners to the Mentor Certification programme, whether applicants are mentoring trainees, early years workers, students or Newly Qualified Teachers (NQTs). If you would like to find out more about this aspect of the scheme, please contact your University link tutor, or Kate Malone, our Placements Co-ordinator. 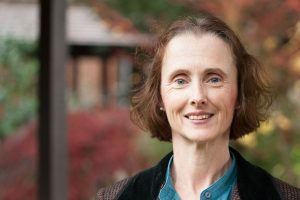 In a new series of monthly blogs highlighting key research areas of activity at the IoE, Professor Suzanne Graham, Director of Research for the Institution, looks at two large collaborative projects that will promote the importance of Modern Foreign Languages as well as researching learners’ development and motivation in language learning. The first, The Language Magician, is an EU-funded project led by the Goethe Institute in which Dr Louise Courtney and Suzanne Graham are building on their earlier research into primary modern languages. Their expertise is contributing to the creation of a computer game to assess language learning for young learners, which will be rolled out across several countries in 2018. They are also exploring the development of learners’ motivation for language learning. Louise and Suzanne have just returned from Leipzig where they worked with project partners on the game. Louise also presented at the mid-project conference on January 27, giving two papers on the value of the game for primary school teachers across Europe and beyond and what piloting of the game reveals about learners’ motivation in different European countries. 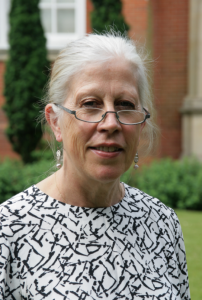 Suzanne is Strand Lead for the second project, Linguistic Creativity in Language Learning, which is part of a large AHRC funded project led by Katrin Kohl at the University of Oxford, Creative Multilingualism. The strand is exploring the impact of literary and non-literary texts on the linguistic and motivational development of learners of French and German at secondary school. Suzanne was part of the project’s launch event, Linguamania, at the Ashmolean Museum on January 27, and gave a presentation at the launch conference. 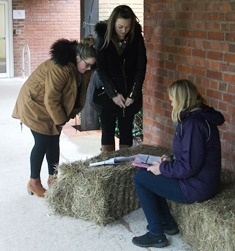 Students from the Institute of Education (IoE) organised a book sale recently in aid of local charity Daisy’s Dream, which supports children and young people going through bereavement. The students, all on the IoE’s BA (Hons)Children’s Development and Learning (BA CDL) programme, raised £143 to aid the charity’s work in responding to the needs of children and families affected by life threatening illness or bereavement. BA CDL Student Representatives Victoria Savage and Sam Boseley presented Yvonne Haines from Daisy’s Dream with the money they had raised. 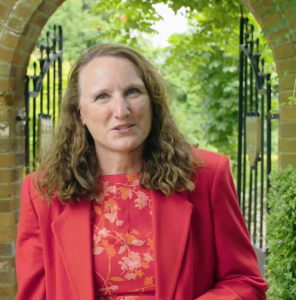 Yvonne then offered a moving insight into the work of Daisy’s Dream in supporting bereaved and distressed children in Berkshire and the surrounding areas.